A City that was dubiously awarded the title of one of the nation’s “Worst Biking Cities” by Bicycling Magazine three times from 1999 to 2006, has made strides in the last eight years following the direction of the Mayor and through the work and dedication of the bicycle coordinator. A NY Times article from 2009 summarizes their efforts nicely and the importance of leadership from the top. 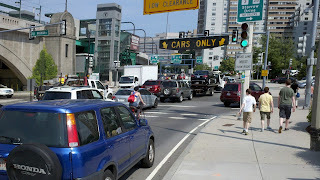 Boston recently ranked 16th in the annual Bicycling Magazine survey and the work is apparent. There were a few notable exceptions which I pointed out and I think are informative. This is one of my favorite series of signs that indicate the historic use of space in Boston's streetscape. 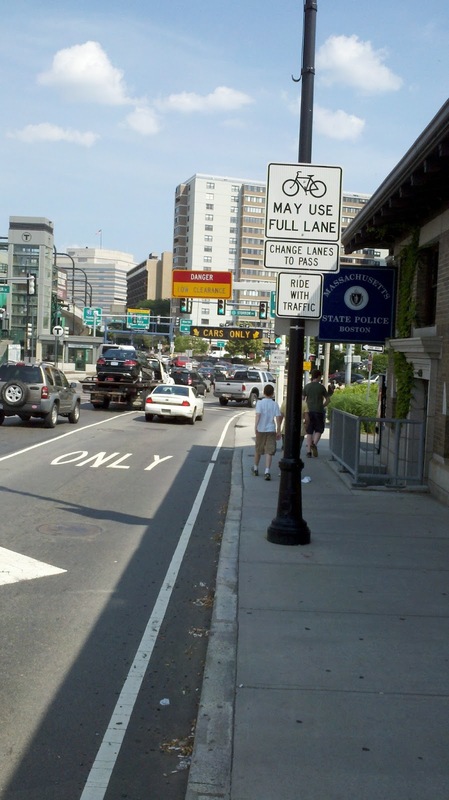 The first sign confirms to people that bicycles have the right to use the full lane. The sign below clarifies to motor vehicle operators (?) 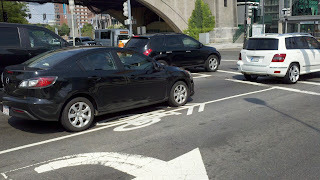 to Change Lanes to Pass (could people on bikes do this too during congestion?) and just one more sign to clarify that people on bikes are supposed to "RIDE WITH TRAFFIC". Clearly, the 12" fog line striping is not suitable for riding a bicycle, so the sign is an apparent attempt to codify what is already happening on the facility. the lane widths seem ample and seem like they could be revised to provide a bicycle lane. You can see the next set of signs downstream of the intersection. The CARS ONLY overhead sign is to warn trucks that they should not be in these lanes, but as a multimodal transportation professional what comes to mind is whether bicycles or motorcycle traffic is not supposed to be in those lanes. The sign is unlikely to be necessary because there is also the low clearance sign overhead. In the second photo, you can see a person on a bike in the lane, but the other cyclists that I saw as I was walking to the train station, were up on the sidewalk sharing the space with people that were walking into the City from the Science Museum. 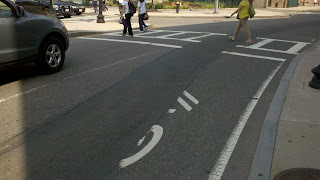 A separate angle on the lane striping at the intersection was worth noting. The application of a sharrow on the lane line is something I haven't seen before. It isn't likely an innovative new treatment, but rather a mistake. I didn't do an assessment to understand which striping came first. I doubt that the intent is to have people on bicycles to split the lanes on the approach to the traffic signal, but I am wondering if an expert witness could make that case. 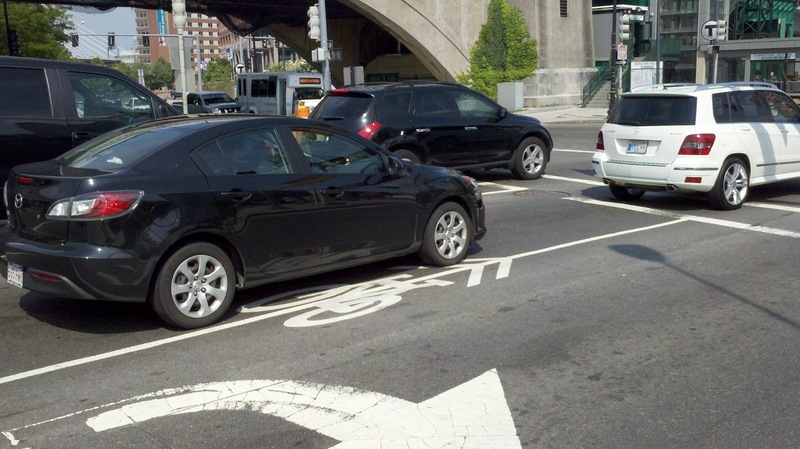 The last example of striping comes at the intersection downstream and a common problem for cities. My solution for this in Portland is to be out on the streets and make sure that I capture these issues and get the private contractors or city Bureaus to restore the striping that they damage as a part of their project. Oftentimes, the temporary pavement is left for awhile (especially during the winter) and it is an unfortunate condition when we stress the importance of markings at the National Committee on Uniform Traffic Control Devices. As a frequent commuter on that route, I should mention that splitting the lane is what 95% of people do here, as most wouldn't be willing to wait behind the long line of cars waiting at lights. Overall though, this is an interesting example of a place where the high level of bike ridership somewhat mitigates the horrendous condition of the infrastructure for bicyclists. I frequently end up a part of a small caravan of riders on their way into town, taking a whole lane to ourselves, and getting a fair amount of space and respect from motorists here, considering the circumstances. The final photo shows something I've been wondering about for a while in Portland. You imply that striping is supposed to be restored. 2) How do we know if it is still temporary? At what point should we report it? Papetti- There are folks that suggest that it's unsafe to do that. I haven't seen much problem with it. There is definitely strength in numbers. Matt- I am advocating for the color to be installed. It's always worth reporting, so we're aware. The priority level varies quite a bit for contractors. 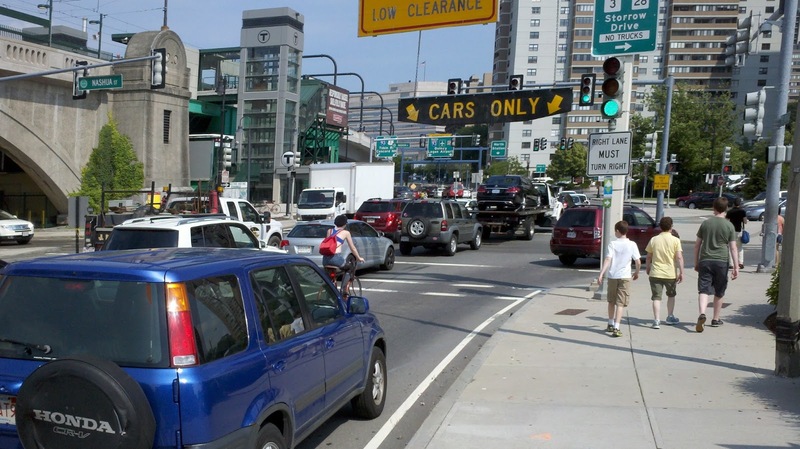 Traffic Engineering Bashing - Justified or Not?